What does is it mean, as a Franciscan Sister of Perpetual Adoration, to minister in modern life by way of sacred traditions? Perspectives Update, asked Laurie Sullivan, FSPA, who says "it's about building relationships of love and empowerment ..."
Perspectives Update: What ministry are you currently serving as an FSPA? Sister Laurie: I am the volunteer coordinator for Catholic Charities of the Diocese of La Crosse in Wisconsin. The organization proclaims Christ's Gospel of Life and promotes human dignity by alleviating poverty and strengthening individuals and families. We work with individuals, families and communities to help them meet their needs, address their issues, eliminate oppression, and build a just and compassionate society. 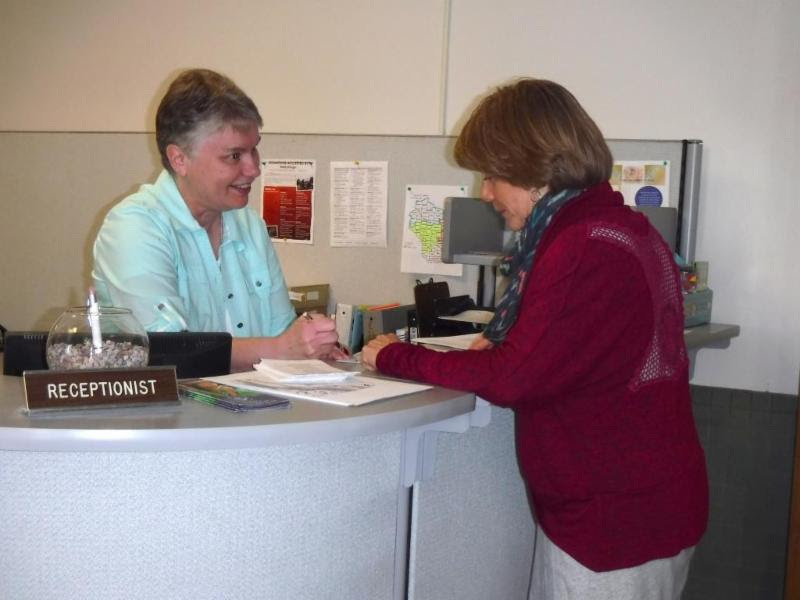 Sister Laurie (left) collaborates with Sandra at Catholic Charities. My role allows me to collaborate with the Catholic Charities staff and volunteers in providing service to families and individuals in promoting human dignity by alleviating poverty and strengthening families and individuals. Using my gifts and talents, I serve those who are marginalized by recruiting and supporting volunteers who minister in a variety of roles, such as in our homeless facilities, hospitality houses, beyond shelter programs and our disabilities services. I strive not only to fill the needs of the agency, but also to empower and recognize each person I encounter. Perspectives Update: What does it mean to you to carry out FSPA ministry in the modernity of the world today? Sister Laurie: I feel it's more important than ever to carry out the FSPA ministry as the world needs to know and experience God's love. FSPA ministry and our Franciscan background call us into relationships, to recognize all people and creation as brothers and sisters. Being grounded in God's love, experienced in the Eucharist, I am sent forth to be that presence of love, to build relationships and spread God's love in the world. 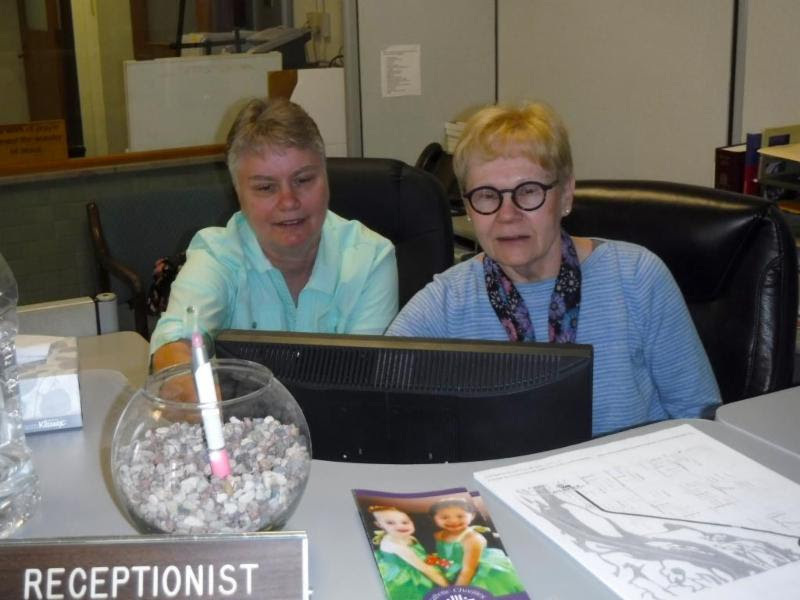 Sister Laurie (left) works with Lori on a project in the Catholic Charities office in La Crosse, Wisconsin. Perspectives Update: How do you continue to do so in honor of FSPA's commitment to sacred tradition? Sister Laurie: The FSPA community has a long tradition of serving and working alongside those who are marginalized, from the early days in orphanages to now, ministering to those afflicted by human traffickingand homelessness. The community believes and strives to work collaboratively with others to help foster empowerment -- not just for people to achieve a better quality of life but also to reach their best potential. As a Franciscan, I am called to live the Gospel in my daily life. I feel it is often seen through the witness I give and the empowerment of others that is more important than the actual day-to-day tasks. Ultimately, it's about building relationships of love and empowerment as Christ calls us to do. Video: Get to know more FSPA as they discuss modern lives and ministry. Connect: Subscribe to FSPA blogs and e-newsletters to receive the good news directly!